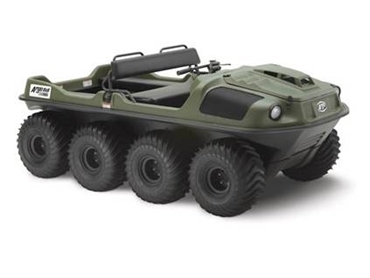 Available now from Argo ATV , the Argo 8x8 750HDi amphibious all terrain utility vehicle is an 8-wheel drive amphibious off-road vehicle with reliable cold weather starting and optimal high altitude performance. Featuring an OHV V-Twin liquid cooled 748cc, 31 hp Kohler Aegis LH 775 electronic fuel-injected engine, the Argo 8x8 750HDi amphibious all terrain utility vehicle features effective throttle response, optimal fuel economy, and a 40% quieter muffler. functional firewall and floor boards for increased leg room.